The Demon of Screamin' gets his guac on. Steven Tyler, lead singer of classic rock band Aerosmith and makeup guru extraordinaire, has been given a gift from the gods: a year’s worth of Chipotle tacos from the Mexican fast food joint. In a video posted by TMZ, Tyler tells a paparazzo that he gets one free taco per day for 365 days. Pretty sweet deal, if you ask us. 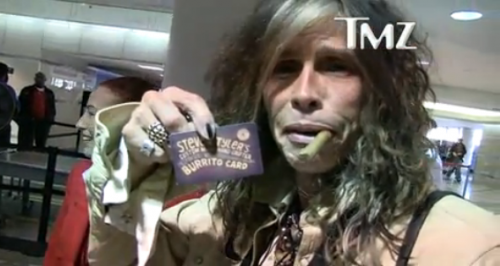 In the video, Tyler holds up the customized Chipotle black card, which says “Steven Tyler’s Burrito Card.” We are badly in need of a “First We Feast Burrito Card,” if you’re reading this, Chipotle.